Actually, it was more like eight or nine or maybe even 10 layers—I lost count after a while. 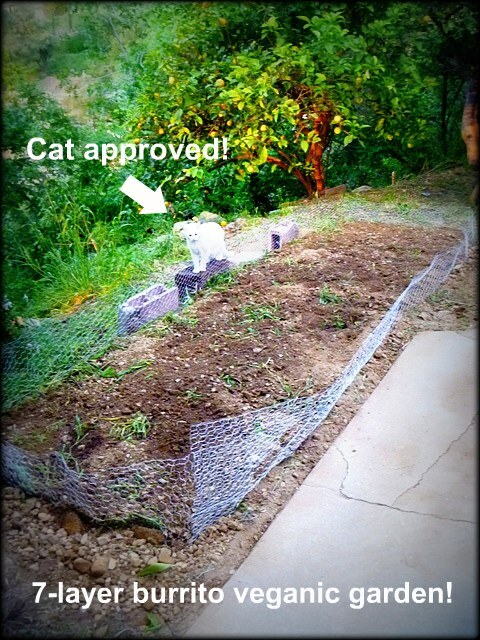 The next time Tom came over, we had two objectives: to line the garden plot with wire mesh (commonly called “chicken wire”…which felt wrong to identify it as such here since it’s a veganic garden!) 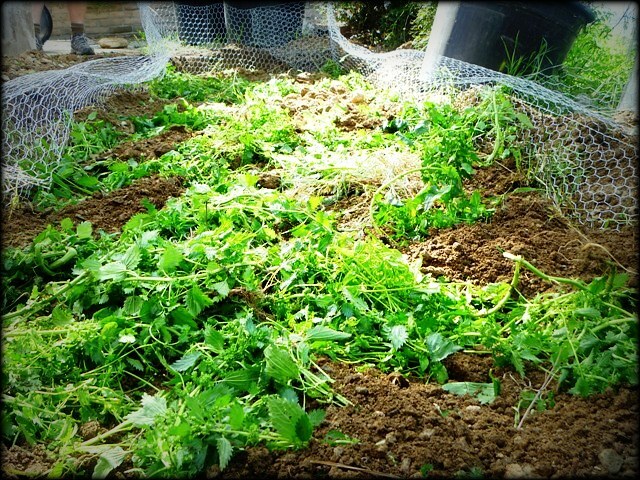 and to layer all that dirt and green manure into the plot. 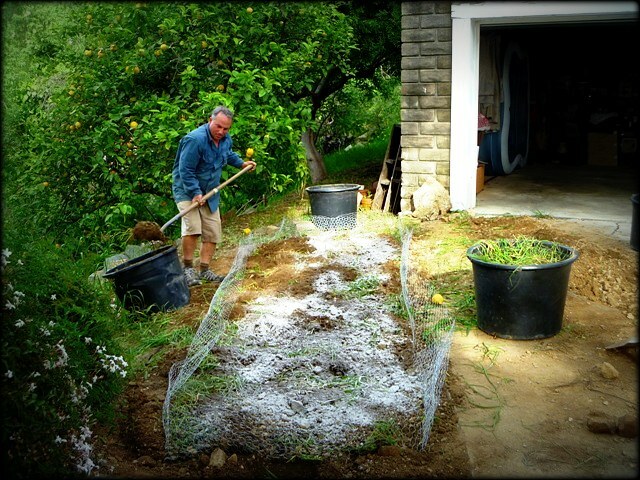 Not everyone needs to line their garden plot with wire mesh. In fact, Tom rarely does this for his other clients. I have to do it because I have ground squirrels and gophers in my yard, but for most people living in the suburbs or city, that’s not an issue. 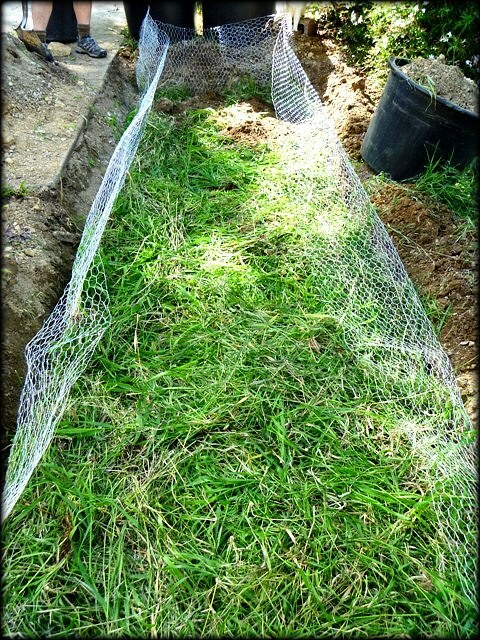 Once we got the wire mesh sewn together, we lined the bottom and sides of the plot, leaving a 2’ “fence” around it. 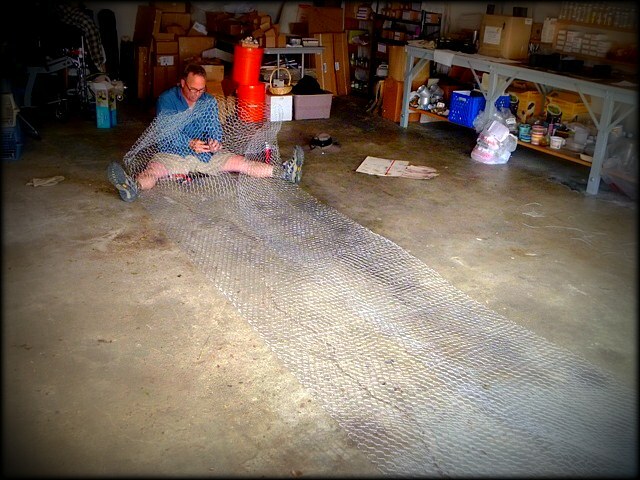 Tom was very concerned about the aesthetics of the mesh above ground (what a professional! ), but it was something that didn’t really bother me. 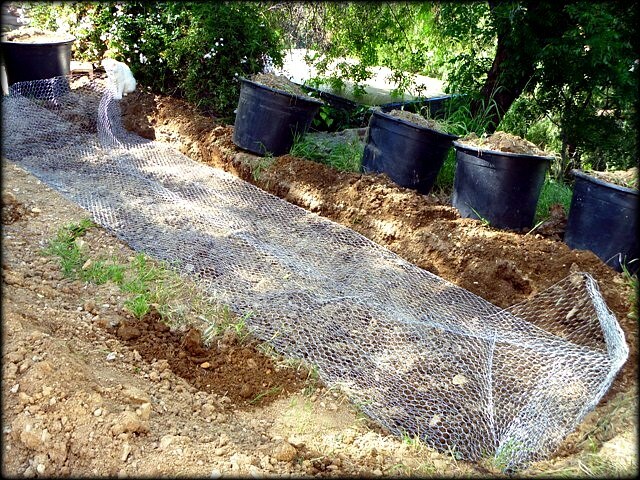 Nonetheless, we talked about planting things around the perimeter that would grow nicely to conceal the wire or maybe finding decorative stones or the like to hide it behind. Now that the mesh was in place, we could begin our layering. 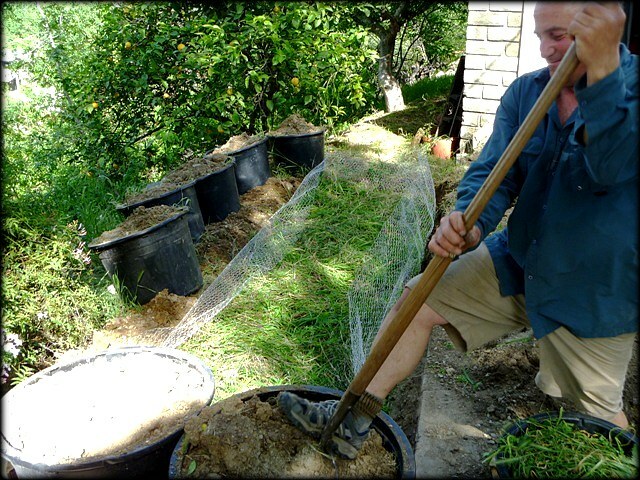 Remember, we are trying to feed the soil in order to create a healthy, sustainable environment for all those microorganisms to thrive in who in turn provide food for the plants. The goal of layering is to provide a good dose of oxygen and nutrients, especially nitrogen. Stinging nettle – from Tom’s backyard. Stinging nettle, which grows wild all over the world, is fast becoming a favorite fertilizer and herbicide in both organic and non-organic agriculture. It is rich in nitrogen, potassium, magnesium, enzymes, and trace minerals, especially iron. It’s known as the “seaweed for the landlocked” (seaweed being one of the most nutrient-dense plants in the world). Stinging nettle also appears to stimulate the “immune system” of plants, making them more resistant to insect and disease attacks. When Tom asked me if I wanted to put his stinging nettle into the mix, I told him, “Hells yeah I want that in my veganic garden!” I’d be a fool not to! Wood ash – from our fireplace. Ash is mostly made up of calcium carbonate which increases soil alkalinity. So, as you can see, our fertilizer for the soil is all organic, is sourced locally (the nettle came from Tom’s yard and everything else from my yard), and contains no animal byproducts. It doesn’t get more veganic than this! And it wasn’t that hard to do. 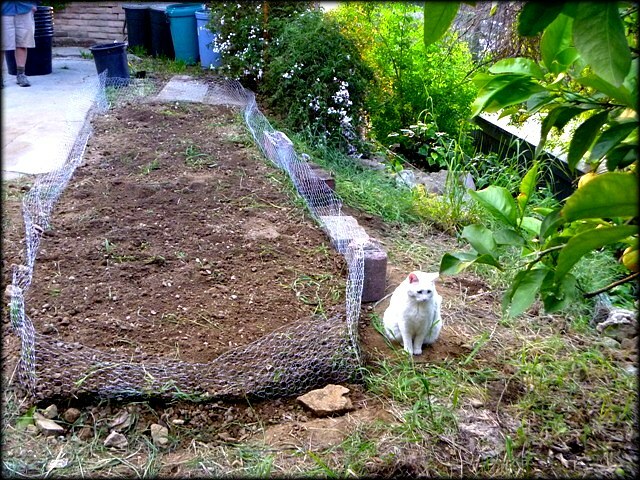 Fortunately, I had pretty good soil to deal with in the first place. 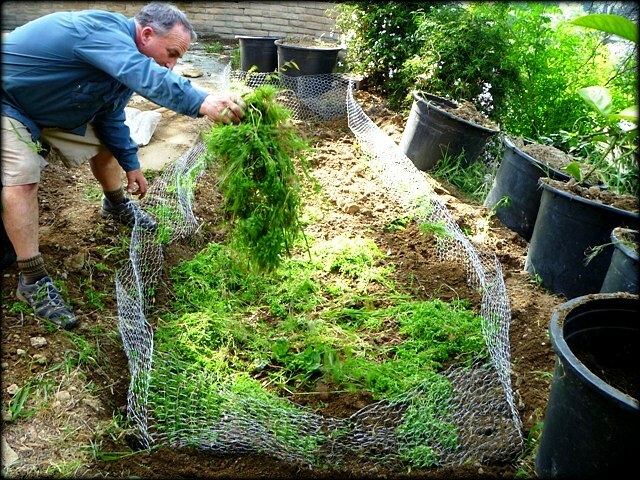 If my soil had been bad, Tom and I talked about what we might have to do to help things along, including buying organic alfalfa meal from a nursery on the East coast. That wasn’t optimal (while it was organic, it wasn’t necessarily veganic…and it wasn’t very sustainable as it would have to be shipped in from across the country) but it may have been the only option that allowed us to keep as close to our veganic principles as possible. But I’m glad we didn’t have to do that and were able to work with what we had right in front of us. 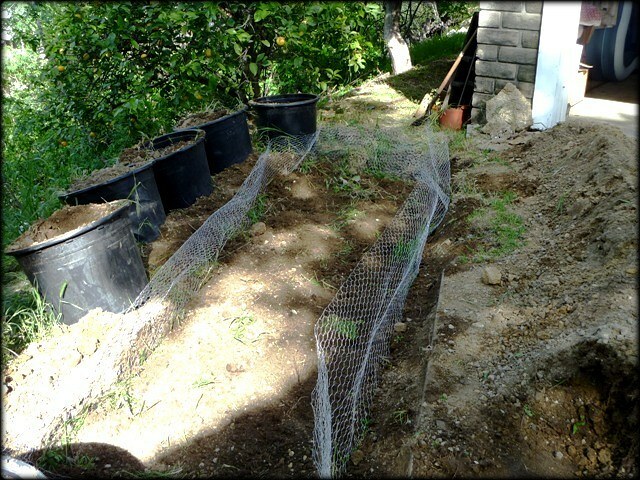 We have one step left before actually planting the seeds (which I can hardly wait to do). This week, Tom and I will be gathering some really rich mulch from my front yard and using it as a top soil. Once that is in place, let the planting begin!! And speaking of, I got my seeds last week in the mail…more on that in my next post!